Pete Marsh Art - Music > Rival Sons the finished painting….or is it? Black Sabbath were supported by Rival Sons during their “The End” tour. I am sure that many bands would jump at the opportunity of supporting one of the most famous bands on their final tour but how many could cut the mustard? The choice of Rival Sons proved to be an excellent one as they rocked the cavernous Manchester Arena with their own brand of hard rock. Jay Buchanan brought a smile to my face when he announced that supporting Black Sabbath was a dream come true…and what a support they were! Rival Sons produced a performance of such drive and intensity that I never once thought of when Sabbath would take the stage. Even though I try to relax and enjoy the music at a concert, I cannot help but “work” during a gig. I am constantly searching for little visual nuances that characterise the performers. I commit all sorts of things to memory in the hope of using some in a painting or original print. During the Rival Sons set I really liked the way Dave Beste on bass just seemed so solid…almost architectural in his pillar like pose. He looked just like he sounded…laying down the rhythm with such authority. Scott Holiday “Mr Fuzz Lord” contrasted Beste in that he pulled some classic “guitar hero” poses looking super cool throughout. I knew that I wanted to paint him near his monitor where he was set against a dark background. I also knew that I wanted the blue Firebird in my painting. Let’s face it, there were plenty of Scott’s guitars from which to choose…but the blue Firebird seemed to epitomise him and fit with the lighting better than any of the others. There’s something about a Gibson Firebird that sets it out as a ROCK guitar. I am sure there are exceptions but really, it just wouldn’t look right in a Reggae band, Indy band, Folk or Jazz band…it’s gotta be Rock. Much later (and after I had completed the painting) I was to discover that this is the one he uses most during live performance, “.. It’s a real rock and roll machine. I love it. It’s my number one. This is the guitar I use the most on stage, definitely.” When I read this I felt my decision had been endorsed. 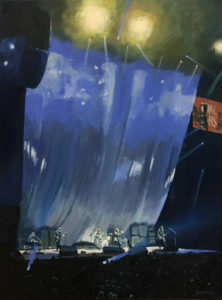 The huge curtain draped behind Mike Miley’s drum kit provided a dramatic backdrop and also went some way in describing the scale of the venue. I’ve been working on a few canvasses over the last few weeks and this one is probably finished…if it isn’t then it isn’t far off. I now need to turn it to the wall for a day or two before looking at it again with fresh eyes. Here it is…I hope it expresses something of the band’s performance.